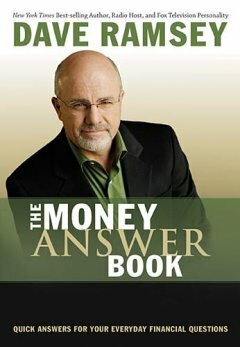 I have listened to Dave Ramsey's radio program before reading this book. This little book of 165 pages is packed with a lot of financial advice and tips, and formatted in an easy-to-read Q&A style. Even for someone who stays in an Asian country, outside the U.S., this book offers a lot of financial principles that can be applied easily in any situation. Nevertheless, some specific topics addressed in the book, such as bankruptcy, divorce, estate planning, children college fund, etc, may not be applicable technically. Essentially, Dave Ramsey adopts an aggressively conservative approach to finance management. His approach is an absolute, blanket-rule, NO to debt, particularly credit card debt - which in a sense is good, as the Bible says that "The rich rule over the poor, and the borrower is servant to the lender" Prov 22:7, NIV. Read his articles on debt in his website here and here. Although this may seems unpractical at times, but we should not be a slave to credit card. Being credit card debt free must be one of our financial goals at all times. If you feel credit card service is indispensable, then you need to read Dave Ramsey's view on this issue. I like the section on saving. According to Dave, saving is not a matter of having more money in your pocket before you can do so. Saving is a matter of emotional priority. You will only save money when it becomes an emotional priority. The secret to saving, therefore, is FOCUSED EMOTION. This is because advertisers everywhere will try to appeal to our emotions every day and tempt to take every dollar we have by blurring the distinction between WANTS and NEEDs. In short, I enjoyed reading this book. It is written in a fun, witty and at times, rather blunt way - typical of Dave Ramsey's style - for those who have listened to his radio program before. Personal finance is 20 percent head knowledge and 80 percent behavior. Your first responsibility is not the pursuit of your own happiness; it is to feed your family. As long as you have what you need to physically survive, very few things are more important than getting out of debt as quickly as possible. Never invest in anything you don't understand. Never invest unless you understand how it works. It is absolutely OK for a Christian to want to be a millionaire, because as Christians we know that no matter how much we have we own nothing. We are simply managers of the resources God has given us. If we can manage God's money, whether $100 or $1 million, we are OK.
Live on less than you make. It's not rocket science. It is never too early to start teaching your kids about money. Stuffitis is not an incurable disease. It just takes a little maturity and growing up. Allowance spoils a child. Commission helps a child. We DO make enough to save money; we just aren't willing to quit spoiling ourselves with our little projects or pleasures to have enough left to save.